Here in the Villamarina Hotel in Salou we try to ensure we are offering you all the information you will need to ensure you have a fantastic all inclusive holiday. This all inclusive hotel is situated in the old part of Salou just minutes away from the Main train station making this the ideal location for those of you who want to explore. Or it may be that you are a train spotter and would like to watch the trains come through. The Regional Express train leaves Salou station at the following time 7.07, 8.43, 10.13, 19.43 and 20.39 taking approx 1h30mins to get to Barcelona Sants Station. The Catalunya Express train leaves at the following times 14.13. 16.45, 18.18, taking approx 1h20mins to get to Barcelona Sants Station. The Regional Train leaves Salou station at the following times 11.42, 17.36, 18.52, 20.20, taking approx 1h 20 mins to get to Barcelona Sants. Coming back there is a train approx every 2 hours from 06.30am – 21.00pm. Return Tickets from 7 – 11€. Allowing the freedom to do things in your own time and see what you want to see. 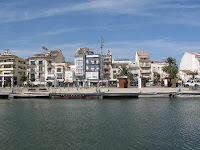 You can also visit other destination within the Costa Dorada or surrounding areas, very easily. The Villamarina Hotel in Salou is a fantastic base to visit Salou, the Costa Dorada and Barcelona. Salou is particularly favoured by British tourists. Salou is served by Reus airport which is only 15 minutes drive away. Salou is located in the Spanish region of Catalunya on the Costa Dorada. 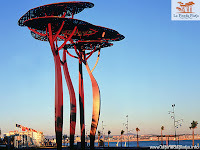 Salou is now one of the main tourist centres in Spain. Along its extensive coast you will find beautiful beaches and coves with fine sand. Salou offers an exceptional climate and is the ideal place with its shallow waters for enjoying the sea in a family holiday. Many different kinds of water sports are on offer in Salou, such as jet skiing, banana boat rides and paragliding. Salou's Levante beach is one of the most well known on the Costa Dorada. The Blue Flag Levante Beach in Salou has showers and toilets, loungers, parasols several large car parks and snack bars on the beach. There is a big promenade with shops and restaurants surrounded by palm trees. The sailing club separates it from Poniente Beach. This promenade is also home to the amazing magical fountains. This beach is just a 10 min walk away from the Hotel Villa Marina. In Salou you can discover lovely landscapes or spend an exciting day at Port Aventura theme park. Local cuisine is based on excellent sea food and is well worth a try. If you are not a sea food lover there are plenty of British restaurants offering you the taste of home. If you are looking for nightlife Salou is home to many family bars, late night bars and Disco's. Salou is situated a few kilometres from the Tarragona which is also well worth a visit. Salou spreads over a broad coastal strip in which wide beaches, like those of Llevant or Platja Llarga, alternate with quiet coves of fine, golden sand. Salou is ideal for a sun and beach family holidays. In the south of Catalonia, Costa Dorada, dotted with seaside villages such as La Pineda, Salou, and Cambrils, is an area of long fishing tradition and Salou is home to the Hotel Villa Marina Club. The long beaches are filled with fine sand. The Costa Dorada is the most popular family holiday destination. Suitable for families, and couples the Hotel Villa Marina Club making no exceptions, it offers an ideal tranquil, restful holiday ASWELL AS FUN, ACTIVITY HOLIDAYS. This 3* All inclusive hotel is the only hotel in the Costa dorada which is 100% all inclusive and has 100% occupancy to the British Market. There are 20 municipalities that make up Costa Dorada stretch along a seacoast of 216 kilometres, with 786 hectares of extensive, clean, sandy beaches washed by crystal, shallow waters. Lying between the sea and the mountain range are wide open areas, home to tranquil villages and fields of crops ranging from vineyards and olive groves to carob, hazelnut, almond trees and vegetable-garden crops. In total the area has over 500,000 hotel beds, many campsites and apartments, and it receives an average of 3,500,000 visitors per year with the Villa Marina Club Hotel been very popular with the British Market. Inland, places and towns of interest (such as Reus, Valls, Montblanc, Tortosa) and great medieval monasteries are easily accessible: Poblet, Santes Creus and Scala Dei, as well as picturesque spots that are famous for their beautiful scenery (Prades, Siurana), abrupt sierras with big game reserves (Tivissa, Cardó and Ports de Tortosa), and the unique, extensive Ebro Delta with its labyrinth of irrigation channels and pools. Salou has a blue flag beach and one of the most well known on the Costa Dorada. Levante Beach has all kinds of infrastructures: showers, loungers, several large car parks, and lifeguards who patrol the beach constantly. The Villa Marina Hotel is approx a 10-15 min walk away from the fantastic beaches, however been all inclusive you may not want to leave the Villa Marina. There is a big promenade with all kinds of shops and restaurants surrounded by palm trees. The sailing club separates it from Poniente Beach. All kinds of sports are practised on the beach. The beach front promenade also hosts home to the musical fountains on an evening you can stand and watch the magic (Seasonal). Choose the Villa Marina and you are also only a 10 min taxi journey from the Theme park Port Aventura, a day out for all the family not to be missed. The Hotel Villa Marina is the ideal location for you to explore the Costa dorada or just stay in the hotel and enjoy our entertainment and our all inclusive facilities. From the 18Th October right through to the 1st November, the hotel will be including a Halloween theme in the hotel. Public areas of the hotel will decorated, and our Entertainment team will be including Halloween activities / games in to the daily programme. 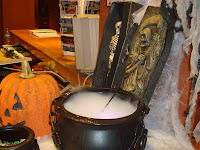 If you are coming to the hotel over this period then don't forget to bring your Halloween outfits, and join in the Fun.